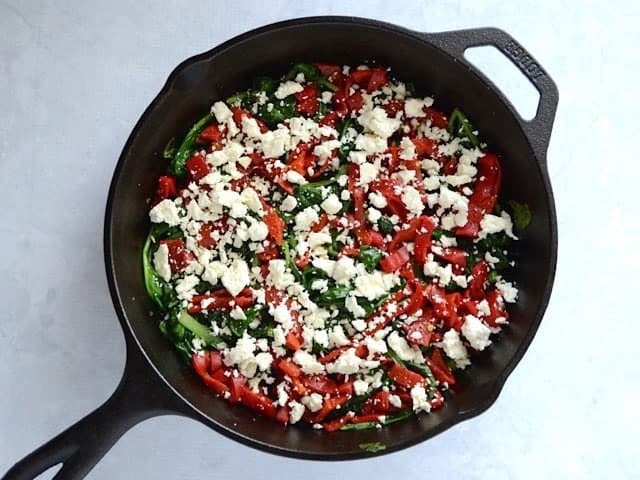 I purchased three rather expensive ingredients this week: roasted red peppers, feta, and a large bag of fresh spinach. I was really intent on not letting any of that go to waste, so after I made my Roasted Red Pepper Hummus Wraps, I grabbed up the leftovers and tossed them into a Roasted Red Pepper and Feta Frittata. Frittatas are great because you can throw just about any leftover vegetable, meat, or cheese into them and have it turn out pretty spectacular. They’re like a big omelet that you don’t have to worry about carefully folding. Just bake everything together, then slice and serve. Easy is good. The one rule you want to stick pretty close to with frittatas is the egg to milk ratio. You should use 1/4 cup milk for every six large eggs. So, if you wanted to double this recipe, just make sure that ratio stays put. You can change up the vegetables, cheese, and meat as you wish. Also, I’d suggest making sure all your vegetables or any other “wet” ingredient gets sautéed to reduce excess moisture, which can throw the frittata off. Other than that, they’re simple, delicious, and an easy way to use leftovers! 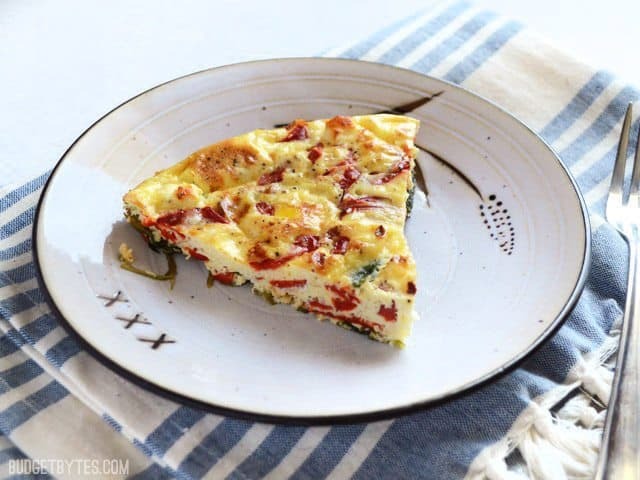 Make sure your leftover ingredients don't go to waste by making a frittata, like this Roasted Red Pepper and Feta Frittata. Preheat the oven to 350 degrees. 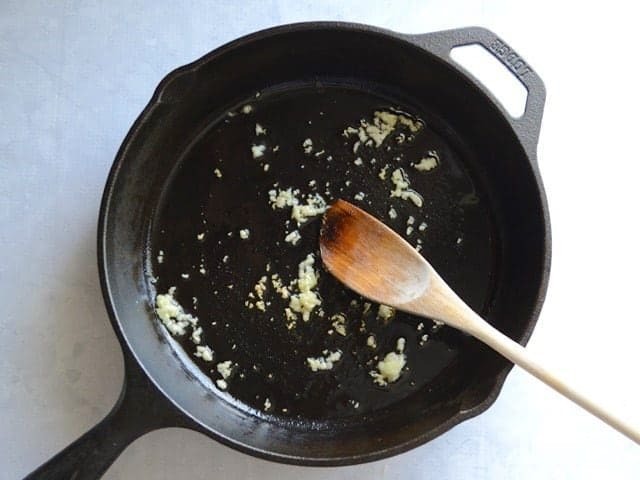 Mince the garlic and add it to a 10" oven safe skillet, along with the canola oil. Sauté over medium heat for 1-2 minutes, or just until the garlic is soft and fragrant. 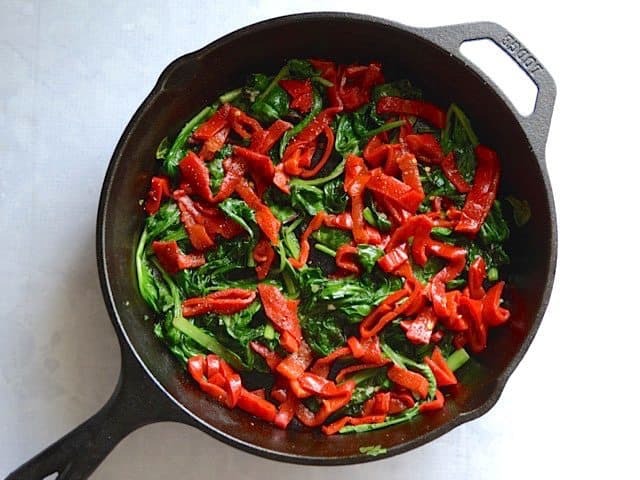 Fill the skillet with fresh spinach (about 3-4 cups packed) and continue to sauté until it has wilted (1-2 minutes). 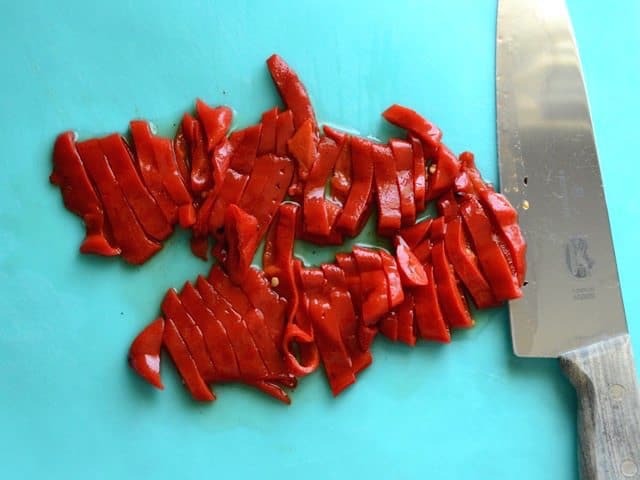 Remove the peppers from the jar and slice into thin strips. Add the sliced peppers to the skillet and sauté for 1-2 minutes more. Season the vegetables with salt, pepper, and a pinch of red pepper flakes if desired. Remove from the heat and crumble the feta over top. Whisk together the eggs and milk, adding a pinch of salt and pepper. Pour the eggs over the vegetables in the skillet, then transfer the skillet to the fully preheated oven. 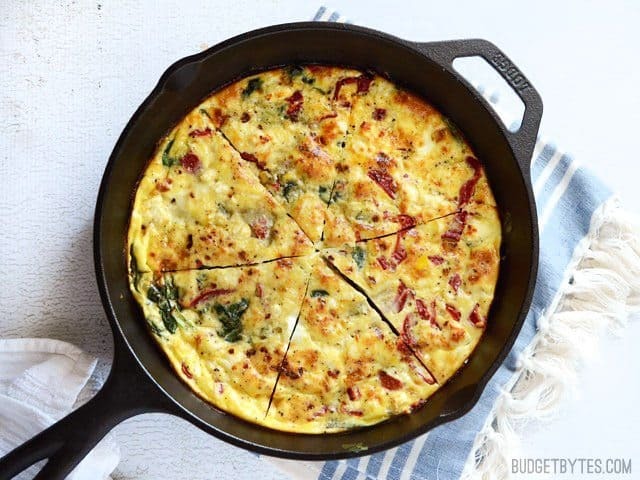 Bake the frittata for 20-25 minutes, or until the center is puffed and the top is light golden brown. If more browning is desired, place the frittata under the broiler for 1-2 minutes. This will quickly brown the top without over cooking the egg inside. Slice into 6-8 pieces and serve (1-2 pieces per person depending on size and appetite). Begin by preheating the oven to 350 degrees. Mince two cloves of garlic and sauté them with 1 Tbsp canola or vegetable oil in a 10″ oven safe skillet. Sauté over medium heat for about one minute, or until the garlic becomes fragrant and soft (try not to let it brown). 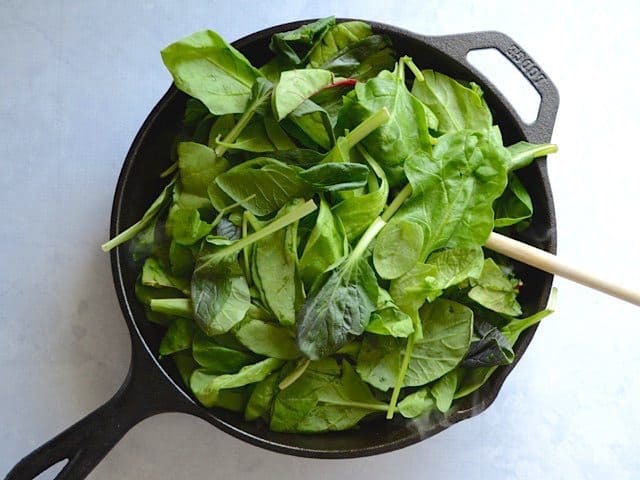 Fill the skillet with fresh spinach (about 3-4 packed cups) and continue to sauté until the spinach wilts. Spinach wilts fast, so it will only take about two minutes. Remove 1/2 the peppers from a 12oz. jar of roasted red peppers, and slice into thin strips. Add the peppers to the skillet and continue to sauté for a minute or two more, just to remove some excess moisture. Season with salt, pepper, and crushed red pepper (optional) to taste. Crumble about 2 oz. of feta over the vegetables in the skillet. Remove from the heat. I buy my feta in an 8 oz. block, so it’s easy to just cut it into four pieces to estimate a 2 oz. chunk. 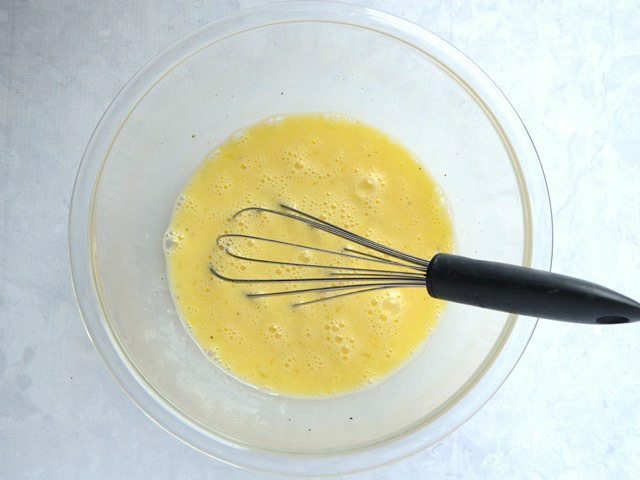 Quickly whisk together 6 large eggs and 1/4 cup milk (whole milk or half and half work best). Season with a pinch of salt and pepper. 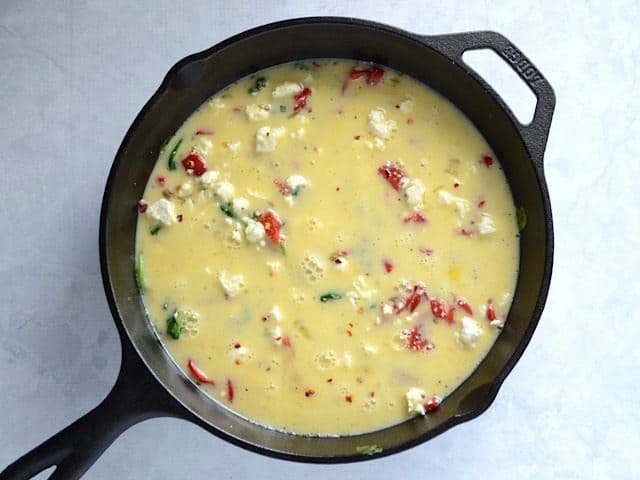 Pour the egg mixture into the skillet over the seasoned vegetables and feta. The skillet should still be pretty hot at this point. Carefully transfer the skillet to the oven. Let the frittata bake for 20-25 minutes, or until the center is puffed up and the top is light golden brown. 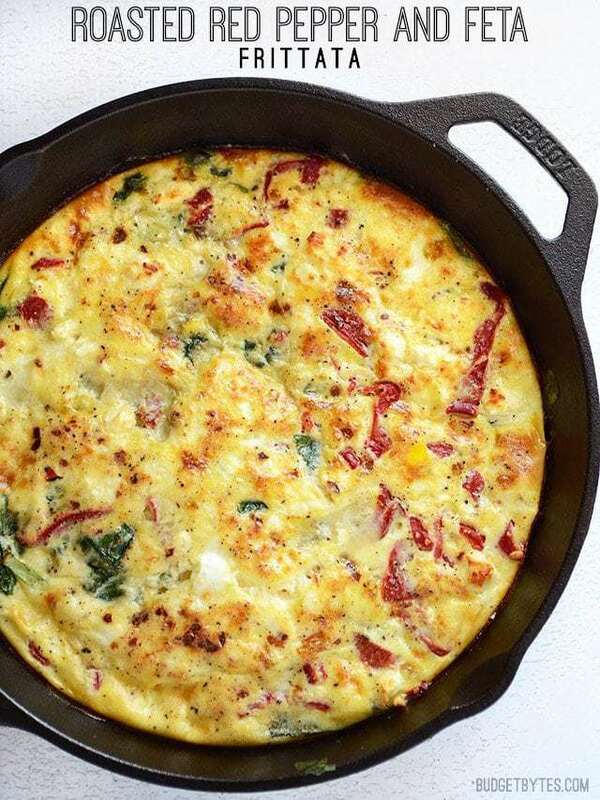 If you want the top more browned than having just a kiss of color, place the frittata under the broiler for a minute. The broiler will quickly brown the top without overcooking the rest. Brunch is served! 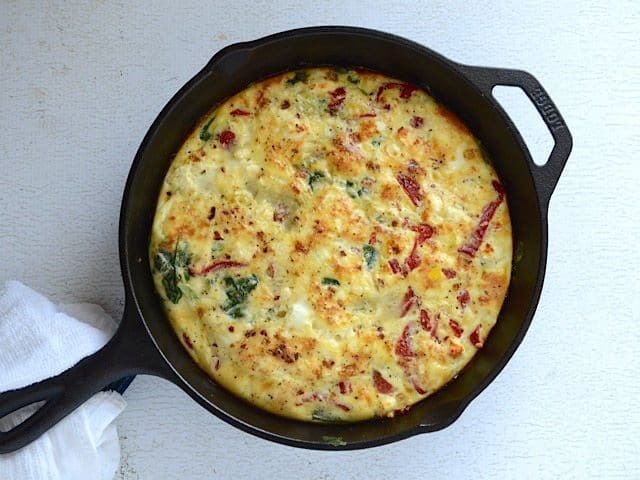 You could also add some shredded mozzarella to this Roasted Red Pepper and Feta Frittata (before pouring in the eggs or sprinkled on top), or maybe some crumbled bacon, artichoke hearts, or ham. Frittatas are extremely versatile! – I was feeding a family of 5 so I used 10 eggs and didn’t bother to measure the milk. 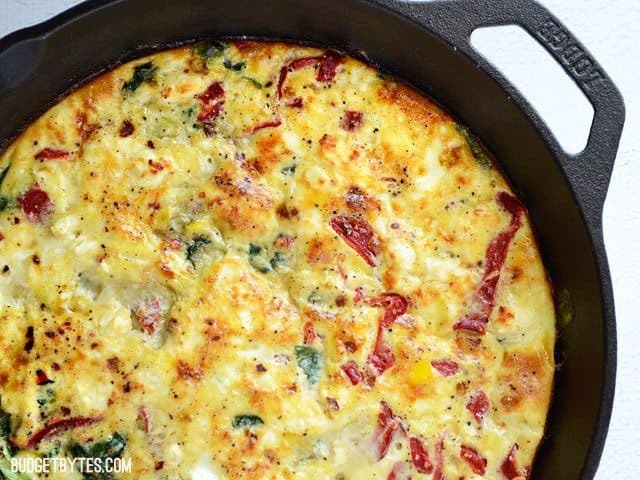 – I used my standard frittata method of setting on the stove and finishing it in the oven. Looks good. Counld you subsitute the feta for a vegetarian cheese like mozzarella? I’m not sure how a vegetarian cheese will do in this recipe, since they don’t melt quite the same.